What I know of Galt is very little except that something horrible, a multiple torture-murder of daughters by their mother, happened there in the 1980’s. It seems a little inconsistent with the happy Galt Strawberry Festival (and family day), but it is a lovely Sunday in spring and we are looking for something to do. Galt is an unassuming agricultural town (Pop. 22, 300) between Stockton and Lodi, and other than its criminal past, it is very quiet. For two days in late May the town turns out to enjoy a carnival of rides, petting zoo, show of red cars both new and classic, meet the local bank manager, and greet the two-dog K9 unit of the Galt police force. Raley’s Market donates food to benefit charities. The Johnsonville Sausage Company sends a monstrous semi truck pulling “the world’s largest grill” and grills bratwursts to benefit the Strong as Steel Cancer Foundation. There are flashier California industries – bio-tech, entertainment, computer and high-tech – that get a lot of attention. Yet California is the country’s powerhouse of farm products. The great Central Valley teems with towns known for and celebrating what defines their fields and livelihoods. California is the country’s number one producer of artichokes, lettuce, tomatoes, walnuts, almonds, figs, asparagus, olives, prunes, wild rice, wine, table grapes, dairy and of course, strawberries. The heart of the state remains rural and we are all invited to drop by for summer festivals. 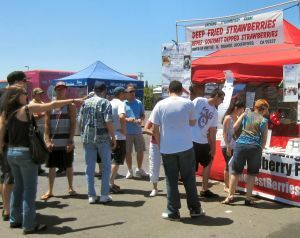 Mixed in with the bar-b-qued turkey legs and tie-died T-shirt booths at Galt’s festival we find strawberry funnel cakes, shortcakes, strawberry topped crepes, berry smoothies, dipped strawberries, strawberry hot sauce, strawberry barbeque sauce, jams, flats of fresh berries and, what appears to be drawing a large and curious crowd… batter coated fried strawberries. We opt for a refreshing strawberry smoothie (blended berries, ice, water…no added sweetener needed) and a tower of strawberry shortcake (crushed berries and whipped cream topping a thick, fluffy-textured vanilla cake). Earlier in the spring you can celebrate artichokes in Castroville, asparagus in Stockton, apricots in Patterson, cherries in Beaumont, dates in Riverside and potatoes in Perris. 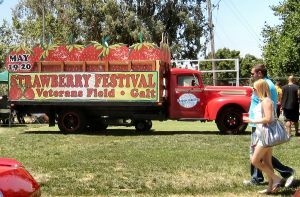 For a dose of local charm check this website for food events still to come in 2012 that welcome all: http://www.foodreference.com/html/california-food-festivals.html .